Malaysian Airlines flight MH17 was shot down by a Russian missile over eastern Ukraine on 17 July 2014 – almost four years ago – while en route from Amsterdam to Kuala Lumpur. The Netherlands authorities have announced who did it – the Russian 53rd Anti-Aircraft Brigade, based in the western Russian city of Kursk using a Buk missile. No surprises there, everybody has known the Russians did it from day one, it’s only Putin who wants to deny it. I blogged about flying over war zones on 9 July 2014 – a week before the Russian attack – and on 29 July 2014, two weeks after the Russian massacre of 298 people. 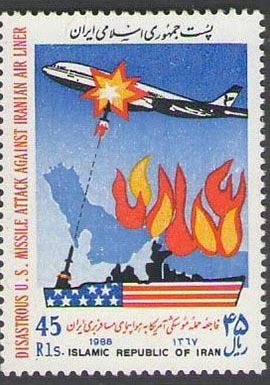 ◄ 3 July 1988 – the US Navy ship USS Vincennes shot down Iran Air flight 655 en route to Dubai, killing 290 people. The USA has described the incident as ‘a terrible human tragedy’ and ‘expressed deep regret over the loss of lives caused by the incident,’ but it has never formally apologized. It has, however, paid out US$62 million. The payment must say something and after all the US navy personnel’s trigger happy human error came about due to ‘combat stress’. 1 September 1983 – a Russian interceptor shoots down Korean Air Lines flight 007, a 747 with 269 passengers and crew on board. The air force pilot reports ‘the target is destroyed.’ There’s no question the Korean aircraft had strayed off course, but it’s also pretty clear the pilot knew he was shooting down a civilian aircraft. The Russians have fessed up they did this one and Boris Yeltsin apologized ‘for the tragedy,’ but the Russians have never had to pay out a rouble. 4 October 2001 and it’s Ukraine again, this time the Ukrainian Air Force accidentally shoots down Siberia Airlines flight 1812 en route from Tel Aviv to Novosibirsk with 78 people on board, most of them Israelis. Of course Ukraine was part of the USSR at the time, but they did admit it was a total idiotic accident (they were practicing playing with missiles, but instead of the intended target over the Black Sea they managed to aim at an airliner). They paid out US$15 million. There have been assorted others, including Libyan Arab Airlines Flight 114 in 1973, shot down by the Israel air force after it overshot Cairo and was attempting to turn back. The Israelis paid out. Now one question is the Russians had their fancy Buk missile, did none of them have a smartphone with the FlightRadar24 app which would have told them they were about to shoot down an innocent airliner? They could have chosen a Singapore Airlines 777 or an Air India 787 instead, they were both overhead? Or perhaps got all three? ▲ MH17 was brought down at 1320 UTC, here’s the FlightRadar24 view of the region at 1320 UTC today. 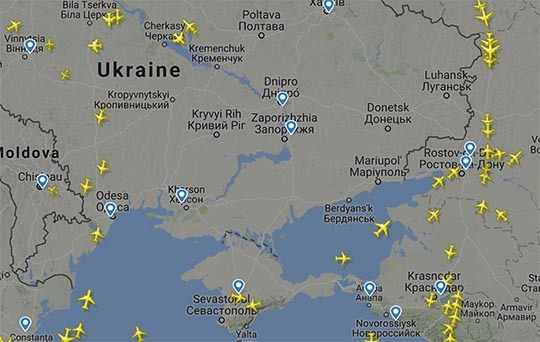 Nothing at all over eastern Ukraine, but plenty happening just east of the border in Russia, Only a few minutes flight from where Putin’s men killed 298 people in a 777. ◄ The app was available to the Russian Buk jockeys, but wasn’t available back when the US Navy was shooting down an Airbus. 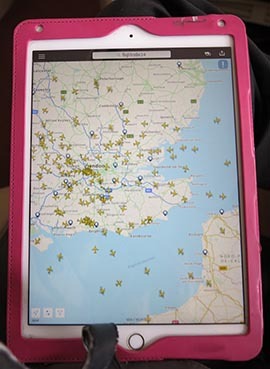 On a Singapore Airlines flight last week I had internet connection, so I clicked on FlightRadar24 and this was the view on my iPad as we came in to Heathrow Airport, London. ▲ A couple of hours earlier I was playing with watching other aircraft as they passed nearby. 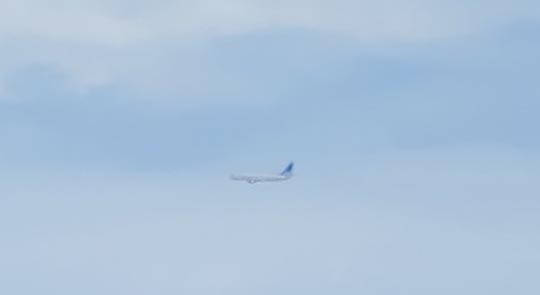 This one, a tiny dot below my A380s engines, was flying south-north as it passed below our east-west route. ▲ I failed to note down where it was flying from or to and the airline, but I could have done. Just like the Russian before they fired their Buk.